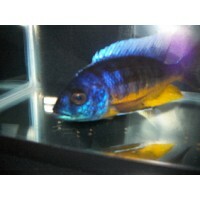 I received my cichlids today and they were absolutely stunning and in perfect health! Jay went above and beyond to ensure that my cichlids were delivered on time and in good health. I have a youtube channel and I plan on uploading a video about my positive experience with CAS very soon. This video s. . . .
Protomelas marginatus Turquoise is a rare haplochromines type fish from Lake Malawi. Males have a blue face and a turquoise body with a black vertical line dividing the body in half. Females are silver with a black line dividing the body in half. Their body usually has dull yellow on it as well. These fish are not always available in the hobby. 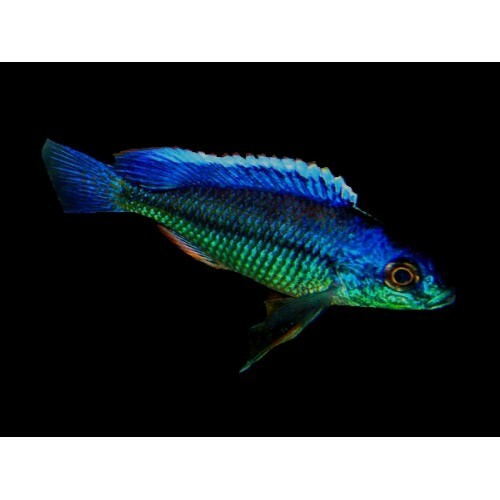 These fish can take time to reach full color and are difficult to photo. To get the best of their color, do not mix them with more aggressive fish. These fish are very slow to color. Mildly aggressive haplochromines that mixes well with most other haplochromines, peacocks, milder mbuna, and milder Lake Victorians. These fish are being grown out from the 2-2.75" Size due to limited supply. These fish may be brought in-stock in 3" or larger males. Smaller sizes are occasionally available through my special order list.